In a packed Lecture Theatre decorated with a Christmas tree, stockings and even a cardboard reindeer, the audience was filled with festive cheer as they eagerly awaited this year’s installment of Vocal Delights.Vocal Delights 2016, true to the season, offered a blend of the ever pervasive pop songs and springy Christmas tunes bound to please – all to be performed fully a capella. Soon after the seats were filled and the obligatory selfies were taken, the emcees, Angela and Lee Yi, were onstage to announce the arrival of guests from the concert beneficiary Club Rainbow, a non-profit organization providing services for chronically ill children and their families With a gentle reminder from Angela to put any beeping devices on silent to avoid any ‘unintended musical accompaniment’, Vocal Delights began proper to the sound of spirited cheers from the audience. Hologram, a 9-member group comprising Y5 Chorale members, was the first to take the stage. Immediately, the familiar tunes of Ed Sheeran’s “Photograph” and Taylor Swift’s “Wildest Dreams” pervaded through the LT.Presenting upbeat versions of both songs, their performance brought a refreshing sound to these arguably-overplayed songs. Donned in matching denim jackets, and brandishing some effervescent displays of theatrics, Hologram undeniably kicked the concert off euphonically through well-executed modern songs by award-winning artists. Introduced for having a “spontaneous” name by the emcees, STX—a group of Y6s—was up next. 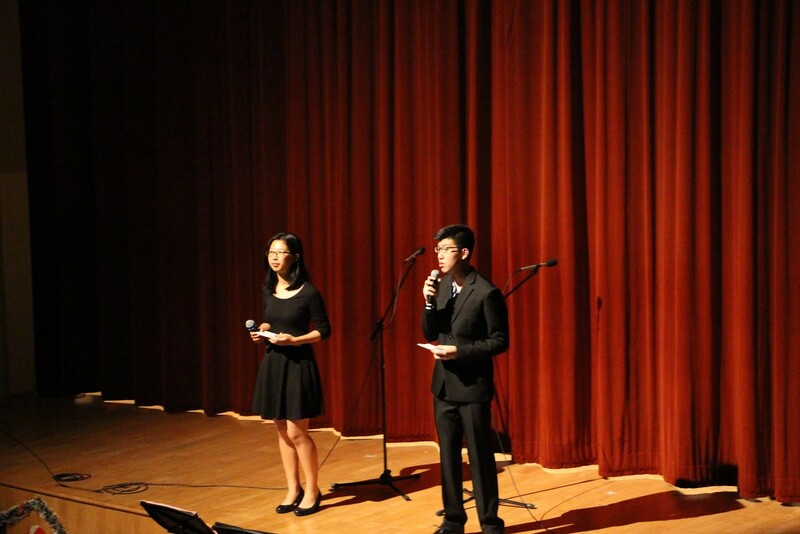 Their first song, “Somewhere Over The Rainbow”, a renowned ballad was performed with class and sophistication. 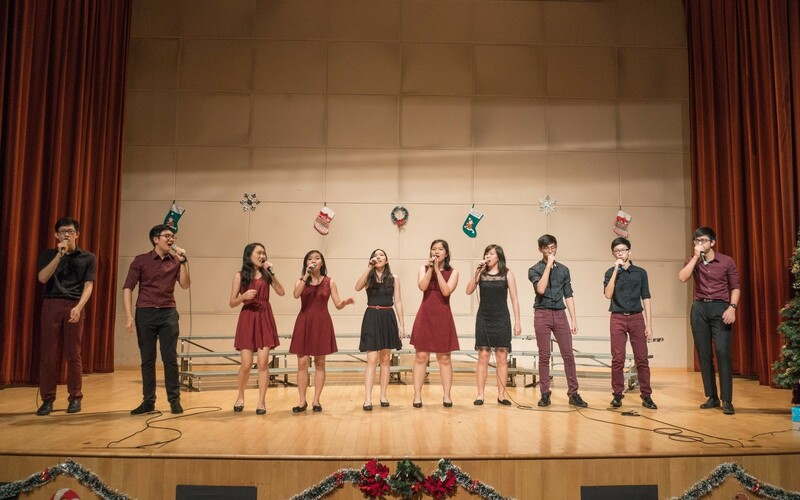 Though it presented a stark contrast to the pop songs performed by the previous group, STX quickly wowed the crowd through their vocal prowess. To live up to their alleged spontaneity, the group made a change from the lineup printed on the programme. 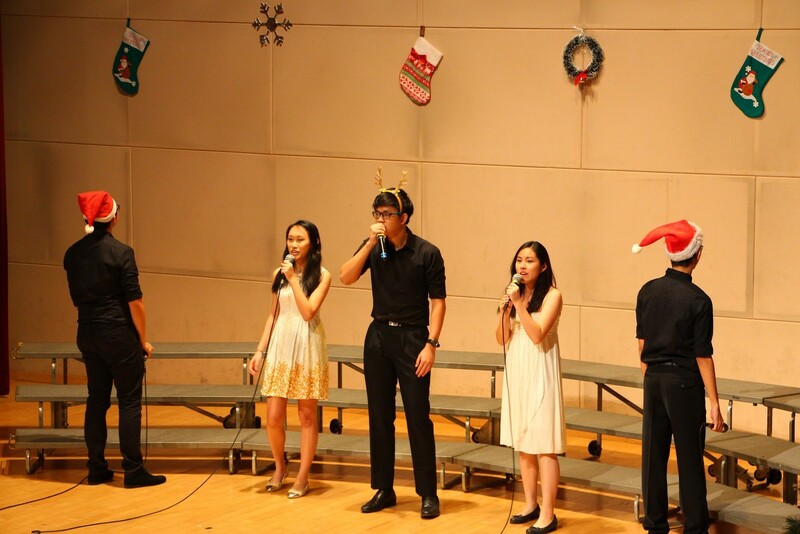 Instead of popular Christmas song “Silver Bells”, STX performed a mashup of pop songs, such as “Royals” by Lorde and “Bad Blood” by Taylor Swift. 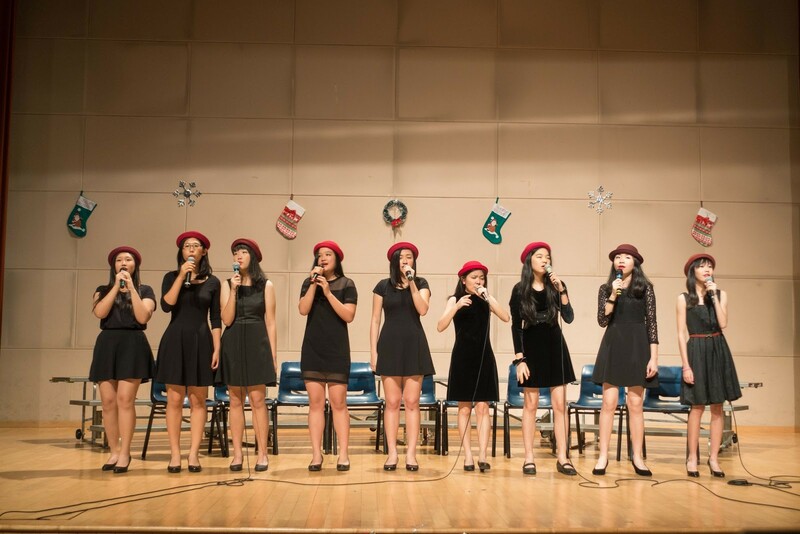 Amidst the changes, the Christmas theme was not forgotten as the group donned Christmas hats and reindeer antlers while segueing from one pop song to another, thoroughly entertaining the audience. Maintaining the momentum of brilliant song after brilliant song, a group made up of Chorale’s executive committee took the stage. The Raffles Number sang traditional Christmas hymn, “O Come, O Come Emmanuel”. The wide vocal range of this mixed gender group and a wonderful solo from Jonathan made for a chilling, breathtaking performance. Transitioning to a more contemporary sound, the group performed One Direction’s hit single, “Drag Me Down”, which was equally impressive. The last group before the intermission was named The Real Dragons, who true to their name, , performed “Radioactive” by Imagine Dragons. Despite only having one song, the group closed off the first half of Vocal Delights lyrically, substituting the instruments of Imagine Dragons with the equally impressive voices of The Real Dragons. 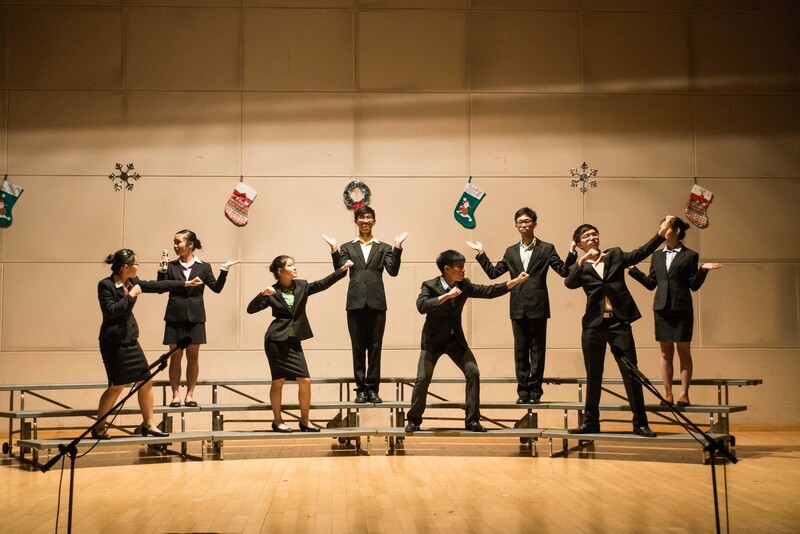 Fringe, dressed in blazers and carrying music scores, welcomed the audience back with warm Christmas classics. Without forgetting the lighthearted mood of the concert, “Hallelujah” ended with a low, bass note that seemed out-of-place, sure to evoke a chuckle from the audience. The second song, “White Christmas”, evoked a dreamy and a wintry Christmas setting. the strong imagery of their lyrics was brought across by their melodious voices, bringing a beautiful, hibernal scene to life. Having Fringe at centre stage, the audience surely experienced the magic of Christmas through song. With the audience thoroughly immersed in the atmosphere, The Octet was the final music group. Bringing unconventional songs, the all-male octet brought a fresh sound to the night. They started off with “12 Days of Christmas Africa”, a doo-wop a cappella originally performed by Straight No Chaser, which mixed Toto’s “Africa” and “Twelve Days of Christmas”, among many other Christmas songs. Putting a spin on the original linearity of the original Christmas carol, the song brought cheery life and humour to the Christmas theme. Boasting the wide range of their abilities, The Octet performed “Mae-e”, a melancholic and moving song whose title roughly translates to “Forward”. Though the meaning of the Japanese lyrics was not understood by majority of the audience, the mellifluous sound of the male voice kept the audience captivated. The highlight of the night for many was Punch, the comedic a cappella group who performed a musical. Dabbling with many pop culture references, punch lines and excerpts from different songs, the musical followed the Christmas adventure of three main characters, accompanied by a background ensemble which interjected as necessary. The audience was enthralled by the different direction the concert took with our three protagonists wishing for a Ben Ten Bluray, a pocket-sized planetarium and a bicep massage respectively, and going off after Santa to find these. Luke, one of the three protagonists, finds the real Santa- relaxing in Hawaii, and is addressed with the all too familiar line- ‘Luke, I am your grandfather.’ Through Punch’s joking and acting, Chorale definitely proved that singing is not their only talent! 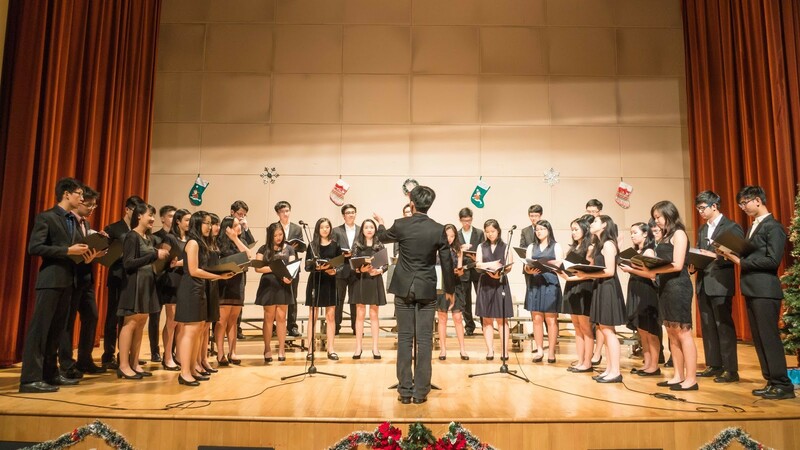 As the concert drew to a close, Chorale came together in their habitual formation as they performed the combined pieces, “Ametsetan” by Javier Busto and “Have Yourself A Merry Little Christmas”. 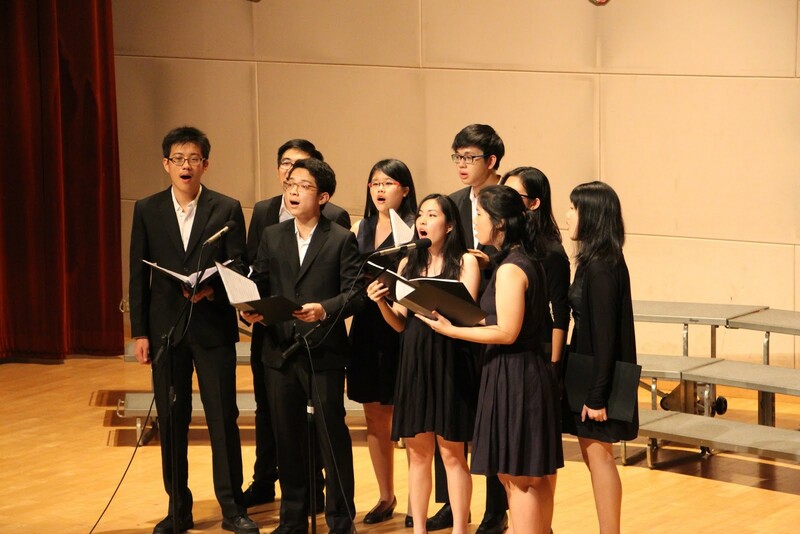 Led by student conductor Reno, the months of student-led efforts by the singers reached a finale. 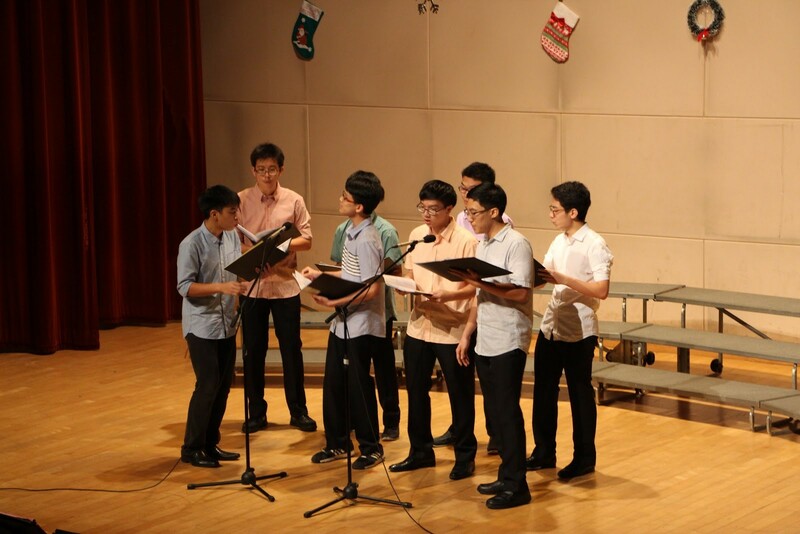 In their individualized performance groups, the individual talents of each Chorale member that night shone, and their ‘exploration of more recent songs of their choosing’, in the words of Chairperson Jonathan Tan, succeeded in enthralling the audience and keeping them well-entertained throughout the night. When put together, for their combined piece Chorale performed marvellously, ushering the night to an end on a very powerful note. The mix of both familiar and unfamiliar carols, oldies and pop music indeed, brought an appropriate closure not just to the concert, but to 2015. Even despite beginning proper preparations ‘only about a month before the concert,’ Jonathan notes that he can ‘confidently say that the concert was extremely fulfilling for all of us.’ Having experienced 2 hours of Christmas cheer, an ambitious musical, and above all, absolutely breathtaking music, we at Raffles Press would wholeheartedly agree with that assessment.